Wow, the Desert RATS Kokopelli 150 Stage Race was an amazing experience! The pendulum swings that I experienced throughout the day were swift and strong. First, the good: I felt great through the first six miles…was even holding down the middle of the pack. And the scenery was absolutely breathtaking…pictures just can’t do it justice. You quickly realize how small you really are in the grand scheme of things. After the first aid station, I felt a second wind but quickly lost it about halfway to the next. Now the bad: I’ve challenged my body in a variety of ways over the years, but this was a totally new experience. At one point, the temperature registered 112 degrees. The desert sun is truly merciless—there is no escaping it! Dizziness, nausea and extreme fatigue were so bad that it took me almost two hours to travel the last 3/4 of a mile to the second (and last) aid station. I would take a few steps only to be forced to sit down again because of how badly I was feeling. I no longer cared about finishing the stage…simply getting to the aid station was the new goal, and I wasn’t even sure it was a realistic one. I’ve never experienced anything like that before. If it wasn’t for Glen, the photographer, who brought me a two liter bottle of cold water and a half liter of coke (of all things), I have no doubt I would still be out there. But as horrible as the experience was, I also learned the resiliency of the mind and body. After about a 30 minute stay at the aid station with some amazing care from the crew and medical staff, I actually left running again! I was absolutely amazed at how a little water, coke and nutrition brought me back to life! And for those who know me well, I know you are thinking that I didn’t have enough water with me. Actually, I had plenty. The problem was no matter how cold the water was when you first put it in your pack, it was steaming hot within an hour. Even though I was still sipping on it, it was doing very little to cool my core, which was part of the problem. Despite all of the issues, I finished the stage! 1. When you focus on someone else’s pain and struggles, you pay less attention to your own. 2. You can’t possibly know, understand or appreciate the depth of your strength until you truly struggle. 3. How do you eat an elephant? One bite at a time—our pep talk from last night, and the one that got me to the start line today…great advice not only for this race but for life in general! Love to my support group back home! I truly would not still be in this race without each one of you…you rock! The trails are desolate, hot and mainly dirt/sand. Shade is a commodity and very hard to come by. I have been amazed at how I will contort my body into small, weird positions just to experience a small piece of shade for a brief reprieve from the relentless desert sun. The food at camp has been nothing short of amazing. We had chicken and dumplings on Monday, cheeseburgers last night, and our chef is currently preparing Spaghetti Bolognese for us tonight (and it smells absolutely amazing)! It’s honestly as good as you’d get at any restaurant…not the camp food I’m used to. The crew and medical staff have been incredible. 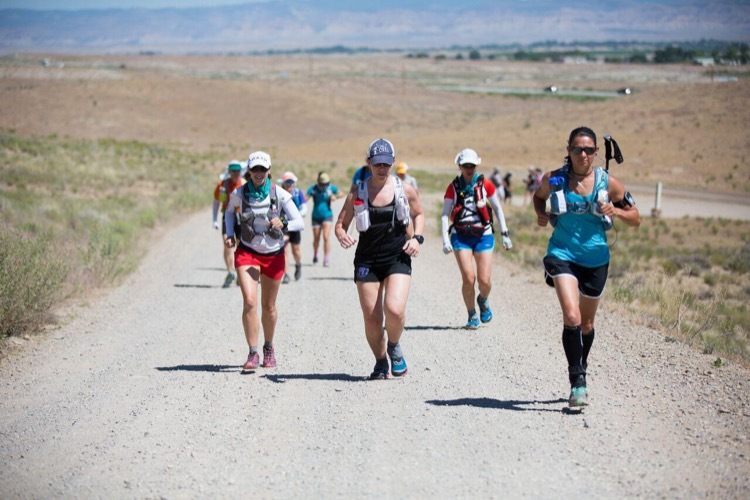 They have made all the difference at each aid station as they wait on you hand and foot while you get a few minutes of rest before heading out for another brutal stretch. In fact, I think there are more of them than there are of us. We even have a camp dog named Coyote, who patiently waits for any leftovers! I bathed in the Colorado River today…first soap and water since Monday, and I did it mainly for my campmates because the water is freezing, though refreshing. We have just been hanging out at base camp since about noon today, and the temperatures are so hot that it’s tough to stay cool even in the shade. It makes me wonder how we’ve been surviving these temperatures out on the trail all week! As fate would have it, they are having record breaking temperatures for this race! It hit 116 degrees yesterday on a 4 mile stretch of pavement…brutal!! With the exception of sore hips, back and feet (no blisters yet, thank goodness), my body is holding up pretty well all things considered. The cramping only lasted a day. I did a better job of listening to and treating my body starting with Tuesday’s stage. I have found that my body appreciates two cups of iced ginger ale or coke and potato chips at each aid station…two things I’ve never even considered before in races. In fact, I don’t even really like soda, but there is something about the sugar and the stomach-settling powers that has me hooked. I now even carry flat coke in one of my water bottles out on the trail. The pickles, which are usually my go to, still taste good but dry my mouth out so I avoid them unless I am in desperate need of some salt. I’ve learned so much about my mind and body in just a few short days! This truly has been a painful but amazing and life changing experience! Cell phone reception has been non-existent since yesterday with a few brief exceptions along the trail. To my awesome support group back home, I will send more photos as soon as we get reception again. I love and miss you all dearly! 1. This trip has gently (ok, not so gently) encouraged me to get back to the basics. I can’t even begin to explain the true joy and happiness a cup of ice water can bring after a hot and desolate 12 mile stretch…or how invigorating a random, though brief, cool breeze can be when the heat is overwhelming…or how pleasant the distant sound of an unknown creature is when you’ve been surrounded by silence for hours. When life gets busy (and it inevitably does), the simple pleasures in life are the first things we forget, but there is beauty all around us if only we’d stop long enough to realize and appreciate it. In the end, those moments are the ones that truly matter and make life worth living…everything else is just a distraction from that. 2. I learned this week that life, and all that it entails, is cyclical. When things are good, you are bound to eventually experience some pain; however, when things are bad, they will eventually get better. Once you understand this, you are amazed at how easy it becomes to work through the tough times. Sometimes the hardest part is just staying in the game…because life does come back. I embarked on this journey in hopes of finding a piece of myself that I thought I had lost. I was desperately hoping I’d find it in the deserts of Utah, but that didn’t happen. Instead, the desert simply reminded me, through struggle and triumph, that I’m stronger than I think. The answers to all of my questions, doubts and concerns were inside of me all along…I just needed a gentle reminder of where they were. When I woke up this morning, my first thought was, “It’s only a marathon.” Crazy because, before Desert Rats, the longest race I had ever competed in was a half marathon. The thought of a full marathon was too daunting, and yet now, it was “only’ a marathon. Funny how all things are relative. Today was amazing because the 11 of us who had started this journey together were all participating in this final stage together…no one opted to sit this one out despite the aches and pains. At every other stage this week, I experienced moments when I was mentally strong but physically weak…or physically strong but mentally weak. Today was the first day both worlds came together, and I felt completely strong…mind and body. There were even moments when my eyes unexpectedly filled with tears because I knew nothing was going to stand in my way of finishing…not a mountain, not the heat, not the threat of a cutoff time, not my mind nor my body. This was it! Six days, 150 miles…and I was going to get a finisher’s medal, and I was going to do it side by side with some amazing people that I met along the way. All the things that terrified me about this race in the beginning were now fueling me in the end. I even found the energy to break out in a few dance moves at a couple of the aid stations with fellow runners, and now lifelong friends, Sarah and Nigel. But my favorite part of the day was watching Ulla cross the finish line. She did it with grace and style, but most importantly with perseverance. She had missed the final aid station cut-off time but asked to remain on the course so that she could finish…and finish she did! She inspired us all! In the end, isn’t that what it’s all about? There is a great sense of pride in accomplishing something that at the onset you weren’t sure was even possible. You walk around with a quiet confidence and a belief that you can do anything you put your mind to. What a powerful, humbling and inspiring feeling! As I boarded the plane to return home, I stopped briefly before stepping through the door, and, for the last time, looked at the mountainous desert in the backdrop and silently thanked it for such an amazing experience. I knew that I was returning home a better version of myself. I have successfully acclimated back into the daily grind, often relying on my experience in the desert and the lessons the desert so graciously taught me when life gets stressful. I don’t want to forget what I’ve learned…the lessons are too important. I have also acclimated back to life’s modern conveniences…a soft bed, a hot shower, a good cup of coffee. As I sit here at a local Starbuck’s putting my final thoughts into words, all I can think about is what I wouldn’t give for the hot sand, the merciless sun, the grueling desert, the endless climbs, the infinite struggle. It’s crazy, but I miss the struggle. I miss waking up to a challenge, not knowing whether I have what it takes, mentally and physically, to meet that challenge. There’s something about testing yourself and pushing your limits that becomes addictive. How great can you be? You’ll never know unless you try something that you think is impossible…that’s right, I said impossible. You may just surprise yourself! You don’t know me, but trust me when I say that there is no logical explanation as to why I was able to finish the race. My running resume paled in comparison to all of the other great people who participated. My training the last couple of weeks leading up to the race was mediocre at best. I was neither accustomed nor acclimated to the heat, elevation or distance. My feet, which are usually susceptible to blisters, were blister-free unlike many of my competitors. The aches and pains I normally experienced during a simple five mile training run back home suddenly vanished, allowing me to survive the long, treacherous runs day after day after day. The stars simply aligned perfectly for me in this one moment in time so that I could discover a strength that I so desperately needed to find. For one moment in time, I experienced the impossible…and because of that, I will forever be a Desert Rat.